LOOK: Do's and Don'ts of Campaigning for Barangay and SK Elections 2018 - Balita Boss! 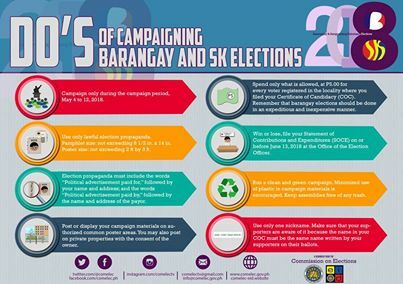 The campaign period for the Barangay and Sangguniang Kabataan (SK) Elections 2018 starts Friday, May 4, and ends on May 12. Learn the do's and don'ts of campaigning provided by COMELEC. Here are the Do's of Campaigning. Here are the Don'ts of Campaigning.